I learned how to perform CPR on my way to Eagle Scout. But, all that theoretical training couldn’t prepare me for the real thing. A stranger suffered a heart attack on Sunday and I helped bring him back to life. This is what that felt like. I am still processing what happened, because it all happened so fast. My dad and I were enjoying a wonderful day of practice and qualifying at big car race weekend. The celebrity race had finished and delivered on its promise of spectacular crashes. We had just finished lunch and were walking over towards the water fountain at turn 1 to a less crowded area when we came upon a man collapsed on the ground. A group of about 15 people were around him, watching as one man was giving him chest compressions. My heartbeat quickened and I was afraid I was looking at a dead man because, at this point, he was. Someone was already on the phone with 911 when it sank in that this was no joke. Everyone was watching as this man’s lifeless head rocked back and forth with each compression of his chest, but no-one was giving him rescue breathing. I gave my dad my water bottle and dropped down beside the man who I will call “John” because I never got his name. I regret that I still do not know it. The guy who was doing compressions, we’ll call him “Luke,” because again, I did not get his name either. I asked Luke how many compressions he had done so far and if anyone had given him any breaths. Luke was giving quick forceful compressions and the guy next to him said “Maybe 20, I have not given him any breaths, but you can”. If it wasn’t already clear how real this was, I was fully invested now. I told Luke to go to 30 and stop while I administered mouth-to-mouth. During the next 10 compressions, I grabbed John’s wobbling head and steadied it with my hands, it was warm, but also so cold. I have held recently killed animals on hunting trips, but this was different. It was another human being, another man. I was extremely nervous, but at the same time extremely focused. I lifted his chin up and opened his mouth to open his windpipe. As I did I could see his eyes rolled back deep in to his head. I searched his mouth for anything that may have blocked his windpipe but did not see anything. I moved his tongue around to get a better view, but it was clear. Whatever else was happening around me, I had it tuned out. Once Luke reached 30 compressions, I pinched John’s nose and cupped my hands over his mouth to make a small barrier. My mouth was extremely close to his, but not directly touching. I gave two deep rescue breaths and could see his chest expand as I did so. I was giving John’s body much needed oxygen. I told Luke to again continue with 3o more compressions, looking back, I forgot to tell him to count out loud so that I could be aware of his tempo. I fixated on John’s face and studied for any sign of life. My fingers danced around his neck as I searched for an artery to tell me if there was a pulse, but I could not find one. John was a large man, 280 - 300 pounds by my estimation and I later learned that he had existing heart problems. The last 30 compressions were completed in less than 20 seconds and I was again down at his mouth giving him two deep rescue breaths. By this point, John had been dead with out a heartbeat for more than a minute and a half. After I finished the two breaths, Luke quickly jumped back into the compressions. I could hear a small grunting noise coming from John with each compression. I motioned Luke to stop and I honed in on John’s mouth to listen. Very faint, very tiny breaths were coming from his mouth. I looked back at his face and his eyes were staring blankly upwards, but they were not rolled back in his head anymore. “HE IS BREATHING!” I exclaimed. At about this point, the on-site event paramedics had just arrived in their golf cart, and began calmly taking control of the situation. John was slowly breathing and the paramedics fixed an oxygen mask over his mouth. They asked me if I knew him, and I said no, they then asked me to move back. One other man who was kneeling down at his feet, looking helpless, said that he was with John. At this point, we were done. John was breathing again. I got up, brushed the dirt from my knees and said a prayer to God, thanking Him that John was still alive. I would love to find out how he is doing right now. I feel an overwhelming sense of compassion for a man I do not even know. I do not know if John survived beyond that day, but I hope and still pray that he did. I am very thankful for the training that I have had and would ask that each of you go out and do the same. This was my first time ever performing CPR in a real life and death situation. My nerves are still a little shaken up from the whole ordeal and writing this has helped me clear my thoughts. I am still unsure how to feel about the whole thing, but I am grateful that I trusted my instincts and acted. A friend of mine who has worked as an EMT on an ambulance was able to help me process it. He said, “You have to know going in to it that they are gone, and just hope that you can bring them back.” I know that many people deal with these kinds of situations on a daily basis for work, and this only furthers my respect for those that work in the emergency and medical fields. Go take a class and learn CPR from professionals. 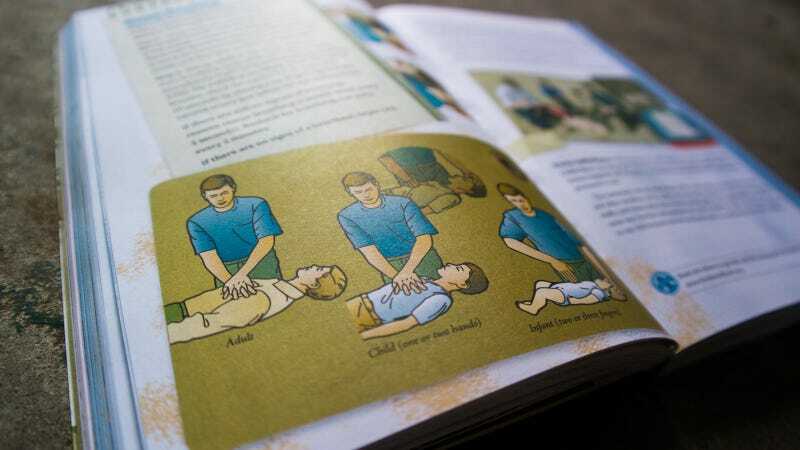 The skills are very simple and extremely effective at saving a life. Four out of five cardiac arrests happen at home, the person you are likely to administer it to is likely to be a loved one or someone you know (AHA) The American Heart Association hosts courses and even has online ones. I have no doubt that the training I had in Scouts is what enabled me to act. Top photo: Chris Brinlee Jr.